Grass Getter is a selective herbicide. It attacks and kills bermuda, crab, foxtail, lovegrass, fescue, cupgrass and all other grass varieties. This is the same product Clyde Robin uses in our production fields, and now it is available to you in a consumer package. Got grass where you don't want it? 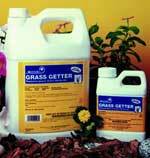 Get rid of it with Grass Getter®. All horticultural species fall into one of only two categories, either broad leaf or narrow leaf. All wildflowers are broad leaf. All grasses are narrow leaf. At LAST, here is a solution for easily and quickly removing grass growing in your wildflower beds! The 8 oz. concentrate mixes into 8 gallons of grass herbicide. Want to the get the most out of Grass Getter? See our Grass Getter Tips! --Select size then add to cart-- 8 oz.$29.95 4,400 sq. ft.